New: checkout matrices and vectors made of strings, with cyclic algebra. NOTA BENE Imagine all code examples below as written in some REPL where expected output is documented as a comment. algebra is under development, but API should not change until version 1.0. I am currently adding more tests and examples to achieve a stable version. Real, Complex, Quaternion, Octonion numbers. Vector and Matrix spaces over any field (included Real numbers, of course :). This is a 60 seconds tutorial to get your hands dirty with algebra. 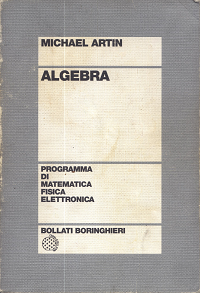 First of all, import algebra package. All code in the examples below should be contained into a single file, like test/quickStart.js. Test algebra quick start in your browser. Use the Real numbers as scalars. Every operator is implemented both as a static function and as an object method. Static operators return raw data, while class methods return object instances. Use static addition operator to add three numbers. The value r is the result of x multiplied by y. Comparison operators equal and notEqual are available, but they cannot be chained. You can also play with Complexes. Create vector space of dimension 2 over Reals. Create two vectors and add them. Create space of matrices 3 x 2 over Reals. Multiply m1 by v1, the result is a vector v3 with dimension 3. In fact we are multiplying a 3 x 2 matrix by a 2 dimensional vector, but v1 is traited as a column vector so it is like a 2 x 1 matrix. //      +------+----→  by removing the middle indices. Let's try with two square matrices 2 x 2. Since m2 is a square matrix we can calculate its determinant. All operators are implemented as static methods and as object methods. In both cases, operands are coerced to raw data. As an example, consider addition of vectors in a plane. The following static methods, give the same result: [4, 6]. The following object methods, give the same result: a vector instance with data [4, 6]. Operators can be chained and accept multiple arguments when it makes sense. Create an algebra cyclic ring, by passing its elements. The elements are provided as a string or an array, which lenght must be a prime number. This is necessary, otherwise the result would be a wild land where you can find zero divisor beasts. Let's create a cyclic ring containing lower case letters, numbers and the blank char. How many are they? They are 26 + 10 + 1 = 37, that is prime! We like it. // The elements String or Array length must be prime. You can also create element instances, and do any kind of operations. Yes, they are scalars so you can build vector or matrix spaces on top of them. Note that, in the particular example above, since the matrix is simmetric it commutes with the vector, hence changing the order of the operands the result is still the same. 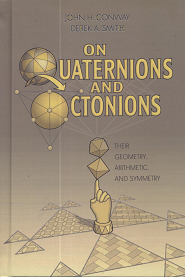 A composition algebra is one of ℝ, ℂ, ℍ, O: Real, Complex, Quaternion, Octonion. A generic function is provided to iterate the Cayley-Dickson construction over any field. Let's use for example the algebra.Boole which implements Boolean Algebra by exporting an object with all the stuff needed by algebra-ring npm package. Maybe we can discover some new byte operator, taken from octonion rich algebra structure. Create an octonion algebra over the binary field, a.k.a Z2 and create the eight units. // Use a single char const for better indentation. The first one corresponds to one, while the rest are immaginary units. Every imaginary unit multiplied by itself gives -1, but since the underlying field is homomorphic to Z2, -1 corresponds to 1. Keeping in mind that Byte space defined above is an algebra, i.e. it has composition laws well defined, you maybe already noticed that, for example byte2 could be seen as corresponding to 4, but in this strange structure we created, 4 * 4 = 2. You can play around with this structure. NOTA BENE The color space example in this section is still a WiP. The scalars are the building blocks, they are the elements you can use to create vectors, matrices, tensors. They are the underneath set enriched with a ring structure which consists of two binary operators that generalize the arithmetic operations of addition and multiplication. A ring that has the commutativity property is called abelian (in honour to Abel) or also a field. Ok, let's make a simple example. Real numbers, with common addition and multiplication are a scalar field: see documentation below. The good new is that you can create any scalar field as long as you provide a set with two internal operations and related neutral elements that satisfy the ring axioms. That is why it will be used something maybe you did not expect could be treated as an algebra: in the examples below during this section we will play with the color space, giving a ring structure. composed of three hexadecimal values from 00 to ff. Let's start defining a sum operator on hexadecimals. Credits and thanks for dec to hex and viceversa conversions goes to this gist author. // Sum modulo 256 and convert to hexadecimal. // Return left padded result. Note that it is used modulo 256 cause we need that our set is closed on this operator, it means that the sum of two colors must be another color. To define color sum we can split a color in an array of three hexadecimals, and sum componentwise. For example, white color ffffff will be splitted in ['ff', 'ff', 'ff']. You can check that this sum is well defined, and for example, green plus blue equals cyan. The neutral element respect to this operator is black (000000). To define a scalar field we need another operation to be used as multiplication. Let's define a multiplication on hexadecimals first. // Multiply, then divide by 255 and convert to hexadecimal. Then similarly to colorSum it is possible to define a colorMul that applies hexMul componentwise. The neutral element for this operator is white (ffffff). We are ready to create our scalar field over RGB colors. Arguments are the same as algebra-ring. Is the neutral element for multiplication operator. In our RGB example it corrensponds to white (ffffff). It is always 0 for scalars, see also Tensor order. The order is a static attribute. The order is also available as attribute of a Scalar class instance. It is said the Gauss brain is uncommonly big and folded, much more than the Einstein brain (both are conserved and studied). Gauss was one of the biggest mathematicians and discovered many important results in many mathematic areas. One of its biggest intuitions, in my opinion, was to realize that the Complex number field is geometrically a plane. The Complex numbers are an extension on the Real numbers, they have a real part and an imaginary part. The imaginary numbers, as named by Descartes later, were discovered by italian mathematicians Cardano, Bombelli among others as a trick to solve third order equations. Complex numbers are a goldmine for mathematics, they are incredibly rich of deepest beauty: just as a divulgative example, take a look to the Mandelbrot set, but please trust me, this is nothing compared to the divine nature of Complex numbers. The first thing I noticed when I started to study the Complex numbers is conjugation. Every Complex number has its conjugate, that is its simmetric counterparte respect to the Real numbers line. It is in alias of Real. It is in alias of VectorSpace(Real)(2). It is in alias of VectorSpace(Real)(3). Real square matrices of rank 2. It is in alias of MatrixSpace(Real)(2). It is in alias of Complex. Complex square matrices of rank 2. It is in alias of MatrixSpace(Complex)(2). Usually it is used the H in honour of Sir Hamilton. It is in alias of Quaternion. A Vector extends the concept of number, since it is defined as a tuple of numbers. For example, the Cartesian plane is a set where every point has two coordinates, the famous (x, y) that is in fact a vector of dimension 2. A Scalar itself can be identified with a vector of dimension 1. We have already seen an implementation of the plain: R2. If you want to find the position of an airplain, you need latitute, longitude but also altitude, hence three coordinates. That is a 3-ple, a tuple with three numbers, a vector of dimension 3. An implementation of the vector space of dimension 3 over reals is given by R3. A Vector class inherits everything from Tensor. Strictly speaking, dimension of a Vector is the number of its elements. It is a static class attribute. It is also defined as a static instance attribute. The norm, at the end, is the square of the vector length: the good old Pythagorean theorem. It is usually defined as the sum of the squares of the coordinates. Anyway, it must be a function that, given an element, returns a positive real number. For example in Complex numbers it is defined as the multiplication of an element and its conjugate: it works as a well defined norm. It is a really important property since it shapes a metric space. In the Euclidean topology it gives us the common sense of space, but it is also important in other spaces, like a functional space. In fact a norm gives us a distance defined as its square root, thus it defines a metric space and hence a topology: a lot of good stuff. Is a static operator that returns the square of the lenght of the vector. This implements a static attribute that returns the square of the length of the vector instance. It is defined only in dimension three. See Cross product on wikipedia. A Matrix class inherits everything from Tensor. It is defined only for square matrices which determinant is not zero. It is defined only for square matrices. It represents the number of varying indices. A scalar has order 0. A vector has order 1. A matrix has order 2.